The Vernier Energy Sensor allows students to easily measure current and voltage. Source terminals connect to energy output sources such as model wind turbines or solar panels, and Load terminals connect to loads such as LEDs, water pumps, resistors, or variable loads. The Vernier Energy Sensor may require a compatible interface and software. Choose a platform below to see compatible interface and software options. The Vernier Energy Sensor is fully supported with LabQuest 2 (version 2.8.5), a standalone data logger with built-in graphing and analysis software. Both Current and Voltage should be zeroed in the data-collection software prior to collecting data. To do this, disconnect the load and source and connect the two Load terminals with a wire. Zero the sensors in the software. Note: Any resistance value shown in the meter in the software is not meaningful when the current and voltage values are near zero. 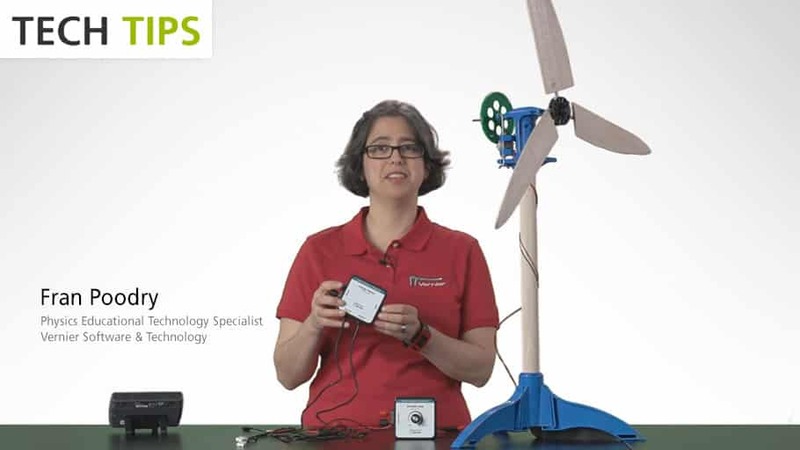 The Vernier Energy Sensor provides a pair of five-way binding posts, labeled Source, to connect the device that is generating power, such as a model wind turbine, solar panel, battery, power supply, or function generator. Another pair of binding post terminals, labeled Load, connect to the load. The load can be any electrical device that is meant to run on DC electricity at a voltage that matches the power source. Examples include the Vernier Variable Load (order code VES-VL), the Vernier Resistor Board (order code VES-RB), single component resistors, motors, or LEDs. These terminals will accept standard banana plugs, alligator clips, or bare wires and provide a solid electrical connection. The Vernier Energy Sensor has two BTA connectors: a Voltage connector and a Current connector. When both connectors are connected to a Vernier interface, the data-collection software automatically identifies the sensor and loads a data-collection setup. If you are using the recommended versions of Logger Pro, Logger Lite, or LabQuest App for data collection, this data-collection setup is loaded when both connectors are used. Calculated columns and meters for power, resistance, and energy are created in the file. If you are not using one of the other software titles listed in the Compatible Software section, the sensors will auto-ID as Current and Voltage (Potential) sensors. You will have to manually set up the calculated columns and meters for power, resistance, and energy. If you connect only the Voltage connector or the Current connector, the Energy Sensor will function as a simple voltage or current sensor. The Vernier Energy Sensor measures the potential across the load, as well as the current through the load. If you have watched the related product video(s), followed the troubleshooting steps, and are still having trouble with your Vernier Energy Sensor, contact Vernier Technical Support at support@vernier.com or call 888-837-6437. Support specialists will work with you to determine if the unit needs to be sent in for repair. At that time, a Return Merchandise Authorization (RMA) number will be issued and instructions will be communicated on how to return the unit for repair.